Add some visual disco decor to your wedding reception. 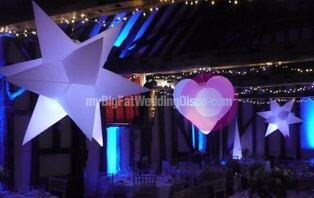 Our inflatable wedding decorations are a great wedding decor idea and are becoming very popular. Each inflatable effect can either be positioned close to the disco or around your reception room. We can tailor these to match your wedding colours as the LCD controllers inside can be adjusted to many popular colour settings. At night, their effect is very illuminating and cool. They look great in the dark with our uplighting service, either with matching or contrasting colours.